I was in need of some birthday cards and when I came across this one at Crafts By Patty, it inspired me to get creating. Don't you just love being inspired to actually create (instead of just pinning)? 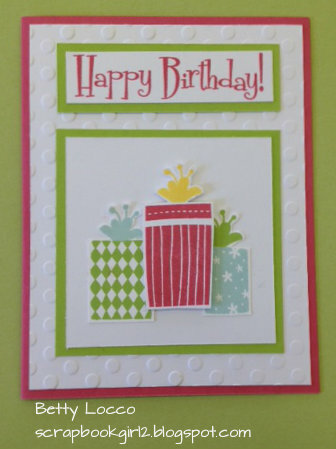 The colors are so bright and fresh - just perfect for a birthday card. This is the card I made for my niece - it is her 13th birthday! The numbers were cut from the Artistry cartridge. The stamp set is D1618 Build-a-Cake and the colors are Hollyhock, Pear, Glacier and Canary. The next card is scraplifted from the inspiration card at Stamps By Patty. It uses the same colors and the Build-a-Cake stamp set. Hope you are inspired to create something for someone special.